southern orders : ARE PRIESTS BETTER THAN THE LAITY? 1. Do you experience priests who place themselves above the laity? 2. Is there a lack of leadership in parishes because the priest does not exercise authority according to his high calling, in other words he sees no authority differentiations between himself and lay leaders. 3. Is the clericalization of the laity and the laiziation of the clergy still a problem today? 4. Should seminarians live a monastic life and should rectories become more monastic with a rule of life for diocesan clergy, i.e. common Liturgy of the Hous and common meals similar to convents? 5. Should clergy and laity be governed by the Magisterium of the Church, meaning Scripture, Tradition and Canon Law? 6. Should clergy share the the bishops’ three-fold ministry to teach, rule and sanctify? A non-issue created by those who want to liberalize the Church. Well, I’m definitely not a theologian or an apologist. Isn’t it the mission of the Church and her clergy (bishops and priests) to lead souls to Christ, and then Christ Himself who sanctifies those souls through the Sacraments CELEBRATED by those clergy? In other words, do the clergy “sanctify” souls or does Christ through the sacraments? The clergy are in the Sacrament of Holy Orders and their actions sanctify, but of course through them, the sacramental sign, it is Christ doing it. Of course Protestants would disagree with the "mediation" aspect of the ordained Catholic priesthood. So when I offer absolution, I am forgiving he sinner and reconciling him to the Church just as Christ is doing. When I consecrate the bread and wine, I am doing it but Christ is doing it too. This stuff just never goes away. Not that there isn't such thing as "clericalism" and elitism among sacred orders; of course there is, because there is original sin. - Some of the most insulated, pampered and dictatorial priests you will ever meet are in parishes all about "collaboration" and "Spirit of Vatican II." Know why? 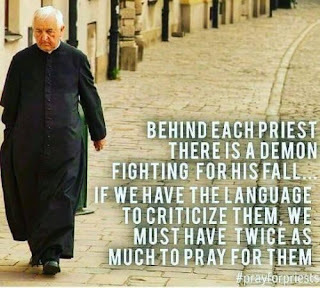 Because the priest will foster clericalized "lay leadership," the priest and this lay caste will all agree on how things should go, and that's that. - On the other hand, if a priest wants to experience lots of humility and mortification, let him defy the spirit of the age, and especially the "Spirit of Vatican II," and instead, let him stand up on Sunday after Sunday, and actually quote -- and implement -- what Vatican II actually said. Let him seek to celebrate the Mass and the Sacraments as they are meant to be -- it's all in black and white, in the GIRM and in Sacrosanctum Concilium -- and he will be pilloried. He will be eaten alive by the would-be clericalist caste whose presumptions he challenges. He will be anything but cossetted and pampered and treated like a king. - It is absolutely rich to hear the progressives complain about traditionalist clergy being "clerical." The accusation has no meaning. "Above" the laypeople? How? When the priest is sitting for hours in the confessional? Very little about that is "imperial." I'm glad and honored to do it, but it's basically a spiritual garbage dump, and the priest is the guy who deals with the refuse. If you're a priest, and you really want to feel princely? Spend as little time in the confessional as you can. And if you want all to speak well of you, give anodyne homilies that are clever, amusing, but not challenging. - Is the complaint that the bishop is the "dispenser" of Holy Orders and (ordinarily) confirmation; and the priest of the rest of the sacraments? I think that hits closer to the reality. But then, you can't pin that on "clerical" priests, because that is intrinsic to the priesthood. Either you believe Jesus created it that way, or else you have to undermine our confidence in Apostolic Tradition by arguing it all got messed up and so we really don't know. The reference to "ontological change" was a tell. The progressive types really hate that teaching, and wish it went away; but they usually won't admit it. So they say, well, let's not talk about it! Pretend it's not really there. - First: we have bishops and and hierarchs, in the highest places, who are doing an excellent job dismissing the concerns of many of the faithful (including many priests) about the failure of oversight and accountability of the bishops. People have been asking, loudly, what is the full story with McCarrick? Promises to look into the file. Months ago. Silence. Just how long does it take to look through a file? And it's not just McCarrick, of course; he is simply a crystalization of the problem. Variations of "how dare you?" and "don't be divisive!" are just 2 of the 31 flavors of clericalism. - Another example of clericalism: a parish priest or bishop who refuses a legitimate request of the faithful for no good reason. A couple wants to have their wedding Mass in the traditional form -- pre Vatican II. How dare they! Never in "my" parish, thunders the clericalist pastor. Did you see how Bishop McElroy handled his "listening sessions" in San Diego? Anyone who stepped out of line got chucked out the door. - Third example: bishops who make it very clear that if a priest doesn't kowtow -- even when he's exercising legitimate options of his own -- he will be punished. Remember the priest in Chicago who destroyed a banner he found in the attic? Personally, I wouldn't have advertised that, had I been that priest; I would have just done it. But however annoyed the Archbishop was, it's hard to see how the priest did anything beyond his authority. Unless that banner was above a certain value (highly unlikely), it was the prerogative of the priest to dispose of it. If it had been used in sacred liturgy, then simply throwing it away would be irreverent. And I just saw a priest had been removed, in Tennessee, I think -- for taking some very modest -- entirely licit -- steps in the liturgy. People complained. He talked to the priest. The priest manfully stood up to him. Squashed flat. I wonder why that story didn't make the pages of N"C"R? Some clericalism is good, it seems. You are a voice of reason in a sea of insanity we are wading in right now. The most dictatorial and highhanded priests and bishops I have ever interfaced with would pride themselves on being "progressive" or "liberal." But in fact, it's their way or the highway, even when their "way" contradicts Church law and liturgical norms. Because I no longer believe the priest is the "big man on campus" I simply just let them have it when I believe they are out of line. For example, when I was still a cantor at my territorial parish, we concluded the Mass with the hymn "Faith of Our Fathers." I did not select it the "liturgical team" did (it must have been one of their off days). He told me after Mass, thanks for singing that "sexist hymn" and I told him he was a blooming idiot. That guy never bothered me again. FYI, he was a serial liturgical norm violator. The priest is not the same, better, or worse than the laity. He is unique and distiguishable for easy to discern reasons. He has a role, as I recall St Paul used the body of man as a simile. We should care for him to aide him in his distinct role as we care uniquely for the parts of our body with exercise, food, and medicine. When he acts as Christ in our midst he allows us to honor Christ in return. Is the consecrated Host better than other bread? It would not carry us far based on calories alone, but it does what none other can do and can carry us forever if we use it properly. Vatican II emphasized the sanctity of the entire 'People of God' (a phrase which irked Cardinal Heenan, who remarked irritably 'Who are the People Not of God?'). Priests and consecrated religious were no holier than the rest of us. A non-Catholic American sociologist traced the wholesale abandonment of priestly and religious vocation directly back to the Council. What is the incentive, he argued, for giving up what most of us take for granted (sexual relations, a family) if there is no corresponding gain? To be a priest is to take up the Cross in a unique manner. The more hours I spend in the confessional, the more I reflect on that. And there are many other ways a priest shares in Christ's crucifixion. You don't become a priest because you're getting something nice -- other than, of course, Christ himself. Why did Peter, James, John and Andrew drop their nets? It sounds like I would have loved Cardinal Heenan!! The People of God was just another "feel good" phrase slopped around. John Carmel, Cardinal Heenan, was a personal friend of John XXIII. His conversations with Evelyn Waugh are recounted in 'A Bitter Trial'. Waugh saw earlier than most the direction in which Vatican II was leading the Church, and deplored it. Heenan tried to reassure him, but in the end Waugh felt betrayed. When Bugnini's 'Missa Normativa' was trialled in the Sistine Chapel in 1967 Heenan was critical. He doubted it would appeal to men (as opposed to women), confessed that he had not heard of most of the Consilium's members, and surmised (correctly) that they had little pastoral experience. By this time Waugh had been dead for two years. Heenan lived until 1975 but seems to have convinced himself that the Novus Ordo was the will of the Church and resistance was not only futile but wrong. He did, of course, secure the Indult of 1971 which allowed the celebration of the old Mass in England and Wales. He also insisted that the Capitular Mass (10.30 am) in Westminster cathedral be sung in Latin at the High Altar with canons taking the parts of deacon and subdeacon.